"This man pervades Europe like a plague, yet no one has heard of him. That's what puts him on the pinnacle in the records of crime. ... In his whole diabolical career, the police have never been able to pin anything on him. And yet, if there be a crime without a motive, I'll show you Giles Conover! ... If I could free society of this sinister creature, I should feel my own career had reached it's summit." When she goes to show him the Pearl she sees a note from Sherlock Holmes, saying that he is returning the Borgia Pearl for her. Sherlock, back at Baker Street, tells Watson that the Pearl is as "Real as death old fellow. With the blood of twenty men upon it down through the centuries." He then tells Watson about Naomi Drake and Giles Conover. Sherlock doesn't feel good about the security at the museum. As he is shows the museum staff how easy it is to disconnect the wired alarms to the Pearl, the Pearl is stolen. The museum blames Holmes for this tragedy. Lestrade enjoys the turn of events and kid an unamused Holmes and Watson about it. The police capture Conover but he doesn't have the Pearl on him. Lestade detains Conover and Holmes suggests that Conover be allowed to receive food from the outside, by which he will try to send a message back out to his confederates as to where the Pearl is. As Holmes plays the violin back at Baker Street the message does get out. Watson is mad that once again, Holmes fiddles, while his reputation crumbles. Watson has punched a newspaper man who cast wrote badly about Holmes. When Lestade stops by to tell them Conover has been released he tells them about a murder of a man who has had his back broke. Holmes immediately knows what it means. The Oxton Horrow has returned. "A monster Watson with a chest of a buffalo and the arms of a gorilla. His particular method of murder is back braking and it's always the same, the third lumbar vertebrae." 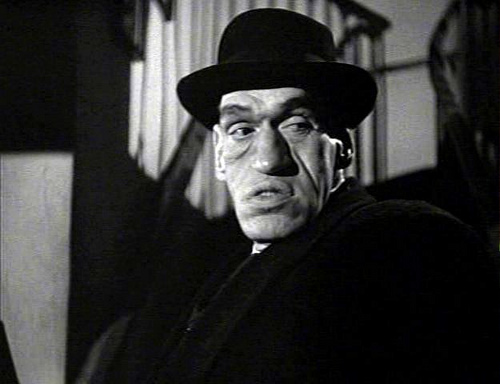 When the Creeper, played by Rondo Hatton (who would reprise this role three more times in non-Holmes movies before his death two years later) comes on the screen late in the movie, it is something of a shock. There is a great scene where Watson tries to impress a disguised Giles Conover with his deductive abilities. Conover leaves a booby trapped book for Holmes. When Holmes returns he smells a cigar and then analyzes the ashes of the Cuban cigar. He knows that the visitor was Conover and he sets off the booby trap. Another murder, another victim with a back broken, and smashed china all around the body, again. Why the smashed china? Another murder, another broken back, more smashed china. Holmes analyzes the china and recognizes statues of Napolean in all three murders. Holmes investigates and finds that there were six busts of Napolean in a shop near Conover's escape and he must have hidden the Pearl in one of them. Holmes can account for five of the busts but discovers the location of the sixth. Holmes soons discover that the address is a forgery - someone has changed it. Naomi Drake calls Conover but Holmes listens in and gets the real information. We also get our first glimpse of the Creeper, in the shadows with Conover. Holmes has Naomi Drake taken into custody. With ten minutes to go in the movie we finally see the Creeper. He accompanies Conover to the house where the sixth bust is.Holmes is already there and in disguise. 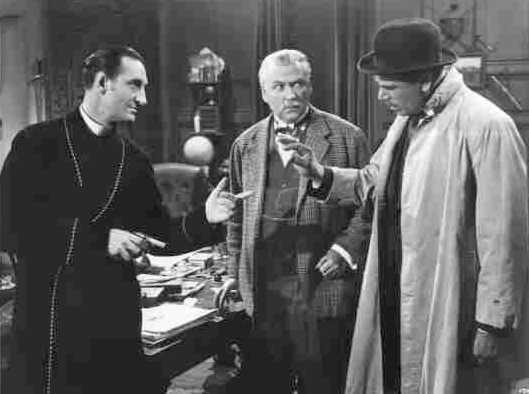 Holmes tells the Creeper that it is Conover's fault that Naomi, who the Creeper loves, has been caught. With five minutes to go in the movie we finally see the Creeper in the light. The Creeper turns on Conover and breaks his back. Holmes shoots and kills the mute Creeper as he advances on him. Holmes ending dialogue references the greed in the world (not mentioning Napolean or Hitler but clearly pointing at them). Holmes : The Borgia Pearl with the blood of five more victims on it. Watson : Well anyhow Conover is one of them. Holmes : What's Conover. No more than the symbol of the greed and cruelty and lust for power that have set men at each other's throats down through the centuries and the struglle will go on Watson for a pearl, a kingdom, perhaps even world dominion till the greed and cruelty have burned out every last one of us and when that time comes perhaps even the pearl will be washed clean again.